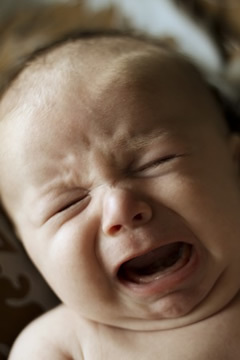 No matter what doctors did, the baby's oxygen levels were dropping as a drug resistant bacteria were eating holes in the lungs of the 7 week old. Even the most powerful antibiotics could not stop the infection. Just two days ago, Madeline had started coughing, a symptom the doctor dismissed as a viral infection. Then Madeline's mother found her limp and blue in her crib and she was rushed to the hospital. She was diagnosed with sepsis and a virulent pneumonia that was destroying her lungs. It was MRSA. The methicillin-resistant form of the bacterium commonly known as staph was first identified in the 1970's in hospitals, but it has since spread across the world, showing up in day cares, schools and other public spaces. Today, 1.2 million MRSA infections occur in hospitals in the U.S. and invasive MRSA kills over 19,000 per year. The bacterium can sometimes "colonize" a person and not cause illness. The person can carry it on their bodies for years and pass them to other people or leave them on surfaces. Hospitals have mounted aggressive campaigns to eliminate MRSA from their facilities. Madeline's parents wondered how she had contracted this dangerous bacterium. Madeline's family agreed to tests to determine if any of them were carrying the deadly bacteria or if the child contracted the bacteria from the hospital. The hospital protested, claiming that their facility is not the source of MRSA. In the past, penicillin was used to treat Staphylococcus aureus infections. Shortly after, S. aureus became resistant to penicillin. During the 1950s, derivatives of penicillin was discovered by pharmaceutical companies that could treat Staphylococcus aureus. The graph below depicts the Spread of Antibiotic-Resistant S. aureus Infections in the United States. Separate curves are shown for bacteria that caused infections in the hospital ("Hospital-Acquired") and in healthy people in the community ("Community-Acquired"). 1. 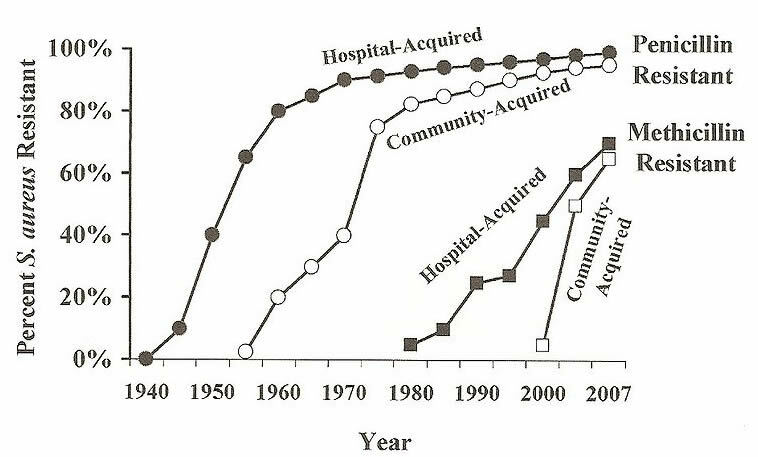 Based on the graph, make an inference about where the "community acquired" penicillin resistant S. aureus originated from. 2. Why did methicillin resistance lag behind penicillin resistance? Based on the trend seen with penicillin, what would you expect to see happen with methicillin? A methicillin resistant Staphylococcus aureus (MRSA) screen is a test that looks for the presence of MRSA and no other pathogens. It is primarily used to identify the presence of MRSA in a colonized person. On a community level, screening may be used to help determine the source of an outbreak. On a national level, additional testing may inform clinicians and researchers about the unique genetic characteristics of the strains of MRSA circulating in the community or health care setting. A nasal swab is collected from the nares (nostrils) of an asymptomatic person and cultured (put onto a special nutrient medium, incubated, and then examined for the growth of characteristic MRSA colonies). A swab may be collected from a wound site or skin lesion of a person who has been previously treated for a MRSA infection and cultured similarly. A screening culture identifies the absence or presence of MRSA and usually takes 1 to 2 days for a result. When studying how bacteria respond to antibiotics, the Kirby-Bauer disk diffusion method is used. In this technique, discs containing antibiotics are placed on agar where bacteria are growing, and the antibiotics diffuse out into the agar. If an antibiotic stops the bacteria from growing, we can see circular areas around the wafers where bacteria have not grown. This area is called the "zone of inhibition." 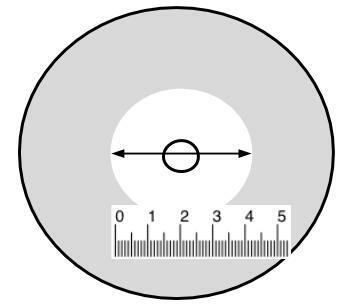 The diameter of these zones is measured as shown below. 3. What methods would hospitals employ to eliminate MRSA from their facilities? 5. A young scientist suggests that a chemical found on the skin of frogs can be used as an antibiotic. Explain how the Kirby-Bauer disk technique could be used to support this hypothesis. 6. Consider the data gathered from the frog-skin experiment. What conclusion would you draw from the data? 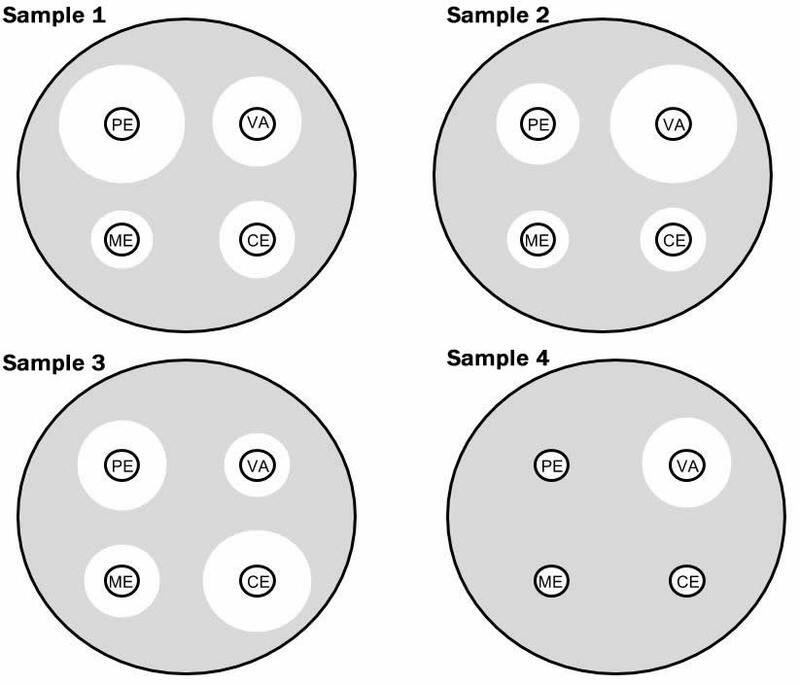 Each plate below represents a sample taken in the investigation. Nasal swabs were taken from individual family members and two samples were taken from the hospital delivery room. The samples were grown on agar with antibiotic disks added. Measure the zones of inhibition on the plates and record the data in the table. 6. The following table identifies the sample sources. Which sample contains MRSA? How do you know? 7. Sample 2 was taken from a nasal swab of a family member who has been having sinus infections. What course of antibiotics would you recommend? 8. What recommendations would you make to Madeline's family and the hospital where Madeline was delivered. Your recommendations should include evidence-based reasoning and details from the case to support your position.